There's a fact dropped very casually at the beginning of The Interrupters, from the voice of an unseen news anchor, that the annual number of murder victims in Chicago has surpassed the annual number of American casualties in Iraq and Afghanistan combined. "War zone" is often a reductive way of describing America's most beleaguered urban communities, but it almost fits the South Side neighborhoods examined by accomplished documentarian Steve James (Hoop Dreams). Into the breach step the members of CeaseFire, the specialized "violence interrupters" that give the film its title. Putting themselves in harm's way on a daily basis, they embody what the government and many of their neighbors seem unable or unwilling to comprehend - sacrifice. Of course, to the three interrupters profiled by James over the course of a year, sacrifice is as familiar as a brother or sister. All of them carry the burden of a past that involves gang membership, or drug dealing, or unspeakable acts of violence. CeaseFire allows them to turn this burden into a tool for change. The organization is built on the theory that the spread of violence exhibits a pattern similar to that of an infectious disease. The interrupters are the patient zeroes of a potential cure, individuals who found a way within themselves to inhibit the causes of violent behavior and who struggle to translate it for a world that enables the whims of the slighted and the vengeful. Hope is a powerful motivator, but so is guilt. The film's often-glimpsed subtext is how violence intervention is as effective in building up the interrupter as it is in assuaging the interrupted. 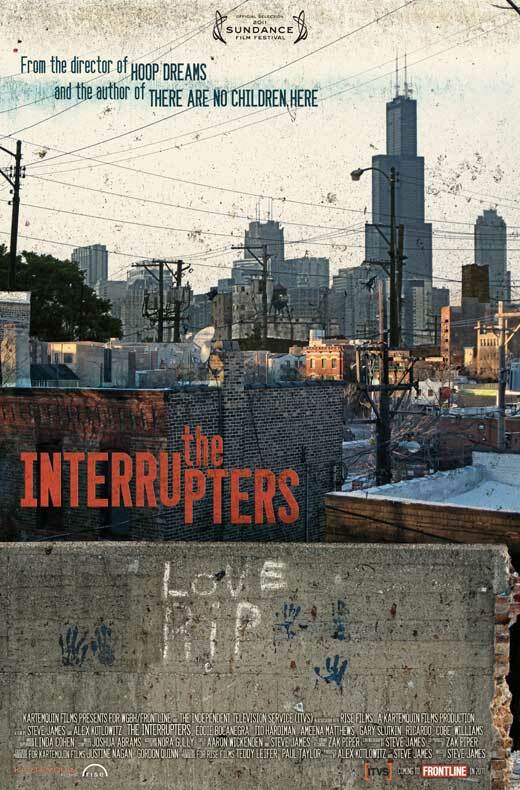 The Interrupters is not as bleak as you might imagine. There is great affirmation in the relationships built between the film's main subjects and the people who need their help. One mediator, a tough-as-nails activist, mother, and progeny of noted Chicago crime lord Jeff Fort, is pushed to her limits by a teenage girl who alternates between red-hot aggression and heartbreaking vulnerability. Another copes with his gangbanging past by reaching out to elementary school children - those who were born witness to a world of violence, and who are on the cusp of entering it themselves - with art therapy. He desperately wants to apologize directly to the families of those he has hurt, but fears their potential reaction. How proud he would be to see CeaseFire's influence reflected in a 17-year-old boy who does just that to his past robbery victims, standing humbled against their torrent of justifiable anguish. Though it's ultimately affirming, The Interrupters is also exhausting. James offers plenty of telling details about how such an epidemic goes unrecognized in an era of 24-hour news coverage. He captures some of the media furor that ensues when the murder of Derrion Albert is captured on cameraphones and goes viral. For a few days, an indignant nation watches as government officials pledge anew to stop the violence in Chicago. (Several months later, some misguided souls in the Illinois legislature suggest deploying the National Guard in Chicago as a sinecure. An emotionally-charged community meeting quashes that boneheaded idea.) But neither James nor the interrupters are naive enough to expect that this will be a turning point. They, like the film, are dedicated to the long haul. The Interrupters does right by its subjects by pulling them into the limelight, even if they are all too aware that they'll quickly fade back into the shadows. It's a massively overwhelming job, but it's necessary and effective. As one client theorizes, an interrupter is like a fly that keeps landing on his face while he tries to nap. You can try to ignore it, he says, "but eventually you got to tend to that fly."